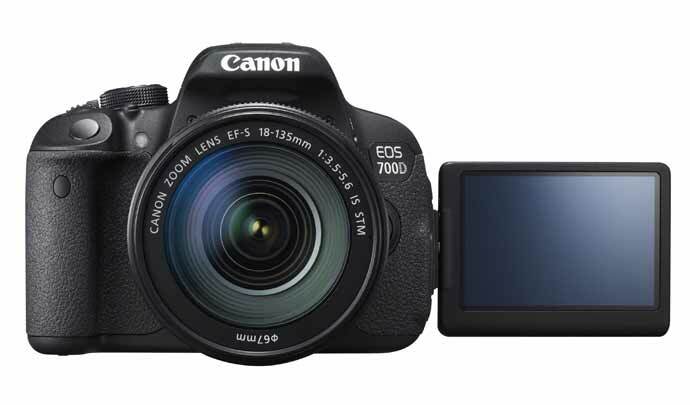 This is the 700D T5i info page – it contains information about the Canon 700D and includes all our pre-release rumour information. 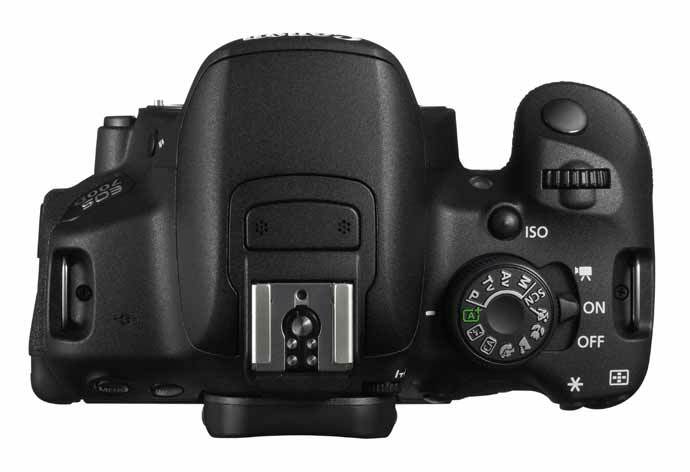 We’ve also got full info on the extra small DSLR the 100D, announced at the same time. 1 Fixes a phenomenon in which focus may not be adjusted with specific lenses when shooting remotely with EOS Utility software. 2 Fixes a phenomenon in which “LCD brightness” may not be adjusted after pressing the SET button if “Menu Display” is assigned to the SET button in the Custom Functions setting (C.Fn-7). 3 Enhances the reliability of the built-in flash exposure. 1. Fixes a phenomenon in which the camera displays Err01 or Err60, or in rare instances will lock up when in Live View shooting mode (or Movie shooting mode) when attached to the following STM zoom lenses: EF-S 18-55mm f/3.5-5.6 IS STM, EF-S 18-135mm f/3.5-5.6 IS STM, EF-S 55-250mm f/4-5.6 IS STM. 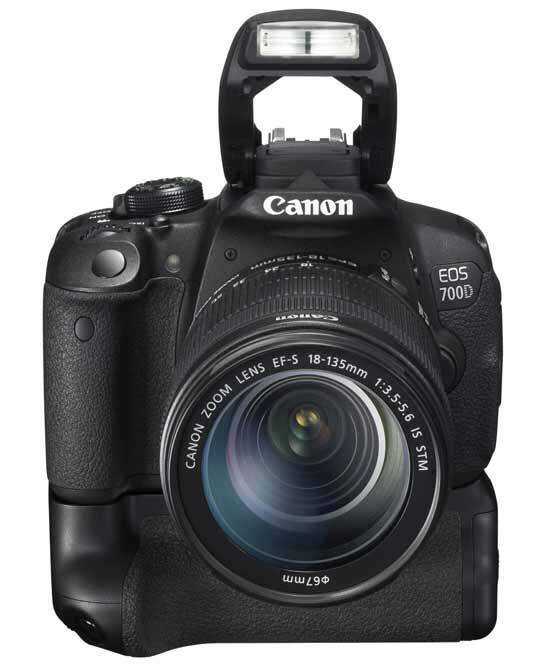 United Kingdom, Republic of Ireland, 21 March 2013 – Canon today unveils two new first-class additions to its entry-level consumer DSLR line-up – the EOS 700D and the smallest and lightest APS-C DSLR ever made[i] the EOS 100D. Complemented by the introduction of a new standard zoom lens, the EF-S 18-55mm f/3.5-5.6 IS STM. The new EF-S 18-55mm f/3.5-5.6 IS STM is the ideal standard zoom lens for both new EOS cameras, combining Canon’s leading Optical Image Stabilizer and Stepping Motor (STM) technologies to deliver minimal image blur and smooth, near-silent focus in movies. The EOS 100D is the smallest and lightest APS-C DSLR in its class[ii] making it compact enough to take everywhere so you can capture adventures in stunning quality. Measuring just 116.8 x 90.7 x 69.4mm and weighing only 407g, the incredibly lightweight and compact body also features a bright Optical Viewfinder – giving users the full, responsive experience of a DSLR in a compact form. The EOS 100D also features a large 7.7cm (3.0”) ClearView II Capacitive Touch screen – making it easy to adjust settings and instantly review shots after capture. At the EOS 100D’s heart is a new 18 MP APS-C Hybrid CMOS AF II Sensor, which combines with the power of the DIGIC 5 image processor to deliver stunning results in virtually any situation. The new sensor uses phase detection pixels spread across 80 per cent of the sensor’s imaging surface to provide increased AF speed and tracking performance when the camera is in live view or when capturing Full-HD movies. Capable of shooting at speeds of up to 4fps, the EOS 100D makes it easy for beginners to capture a range of high quality images, be it of special moments with family and friends or fast-paced action on holiday. The EOS 700D is powered by a Canon-designed and manufactured 18.0MP APS-C Hybrid CMOS sensor and DIGIC 5 image processor, which deliver outstanding levels of resolution – producing images that are consistently rich in detail and colour. Offering up to 5fps shooting, the EOS 700D is ideal for capturing a range of subjects, from fast paced action to stunning skylines, or beautiful portraits of family and friends. Additionally with a native 100-12,800 ISO range, the EOS 700D is capable of catching remarkable levels of detail even when shooting in tricky low light conditions. The EOS 700D’s advanced AF System consists of 9 high performance, cross-type points spread across the frame, delivering greater focussing speed and accuracy to ensure photographers can always keep desired subjects in focus, even as they move around. With the option to manually select and adjust focus points, or simply use full automatic mode, the EOS 700D provides aspiring photographers with an easy way to explore different kinds of image composition as their confidence grows. The EOS 700D features a new, simplified 360° rotating mode dial to provide easy and swift access to the camera’s various shooting modes. A 7.7cm (3.0”) Vari-angle Clear View LCD II Touch screen also makes it easy for users to adjust settings as well as frame, shoot and review from a variety of angles. A new external coating, adopted from Canon’s mid-range EOS models, also provides a more robust and durable finish. EOS 100D featuring new Kids, Food and Candlelight modes, designed to ensure optimum results with stunning detail in a range of familiar situations. Canon’s exciting range of Creative Filters, including Fish-eye and Miniature effect, can now be applied before capture thanks to new real-time filter previews – providing the perfect way to pick the most suitable effect for specific moments before you actually take the shot. Photographers can also learn how to adjust their images with enhanced Creative Auto Mode, and using new Extra Effect Shot mode on the EOS 100D, users can even capture two images simultaneously – one with a Creative Filter applied, as well as one standard image. Aspiring photographers can add another dimension to capturing their memories, using EOS Movies to shoot their precious moments in glorious Full HD resolution (1920x1080p). Hybrid AF II[iii] always keeps the stars of the movie in focus, with continuous AF constantly tracking subjects during shooting. Additionally, Video Snapshot mode makes it easy to capture and edit short video clips to bring to life an exciting day, such as road trips and weddings. The new EF-S 18-55mm f/3.5-5.6 IS STM is the perfect lens for EOS 700D and EOS 100D users to start their photography adventure. From sweeping landscapes to portraits, the versatile 18-55mm zoom range means users can enjoy the flexibility of getting close to subjects or getting more in the shot. Images are captured with precision detail and clarity thanks to a 4-stop Optical Image Stabilizer, which also lets photographers use lower ISO levels and longer shutter speeds. The full time manual focus ring allows users to make precise focus adjustments, while the near-silent STM technology also ensures noise is kept to a minimum whilst focusing – perfect for when capturing movies. EF-S 18-55mm f/3.5-5.6 IS STM is available from late April, with an SRP of £239.99 / €299.99. Pre order or purchase a new Canon EOS 700D or EOS 100D between 21st March – 30th April and receive a Canon 300EG Gadget Bag free of charge. For more info please visit: www.canon.co.uk/bagpromotion. Please note the promotional webpage will be live from 22nd March 2013. The new EF-S 18-55mm f/3.5-5.6 IS STM features Canon’s Stepping Motor (STM) technology – providing smooth, near-silent auto focus – ideal for shooting movies or quiet situations. The STM used in the EF-S 18-55mm f/3.5-5.6 IS STM is a lead screw type, which is quieter and smoother compared to the more compact gear type mechanism. The STM technology works by using two guide bars that are fixed at both ends of the lens’ moveable lens group. When zooming, the focus lens barrel travels in the direction of the optic axis, along the two guide bars, which help to minimise the load on the lens barrel. The Stepping Motor is connected to rack on the lens barrel through a precision lead screw, which then rotates to create the driving force to move the barrel along the optic axis. The EF-S 18-55mm f/3.5-5.6 IS STM features a new non rotating front element ideal for using filters. The lens has been engineered so that the front element does not rotate when users adjust the focus. As a result, any filters applied to the front of the lens remain in a static position, even when the focus ring is adjusted, therefore removing the need to readjust the filter position during shooting – perfect for use with polarising filters. 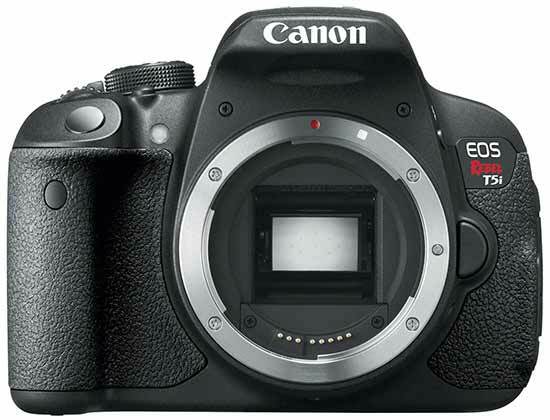 27th A suggested ‘roadmap’ (see general rumours page) suggests 3 DSLRs and several lenses for 2013 – product age would suggest both a 7D2 and 70D, whilst the 650D will be a year old by June. Shortages of the 60D and the need to position any 70D well ahead of a new Rebel (aka 700D) would suggest the 70D first. 22nd In Japan, Impress magazine comes up with suggestions that we will see smaller DSLRs next year from Canon. We’ve also heard nothing suggesting any imminent 700D – Since it’s not 6 months old, anything before mid 2013 would be unusual. 23rd An updated sensor design for the whole 7 series (7/70/700) is suggested for next year – details on the 3D page. Will the 650D be an 18 month or 12 month camera?